GIVEAWAY: Stand a Chance to Win A Pair of Premiere Tickets to HELLBOY! Hellboy will be in cinemas from 11 April. Stand a chance to win a pair of tickets to the premiere event! 1. Share this post with your friends via Facebook. 2. Tell us the name of the creator of the Hellboy comics. 3. 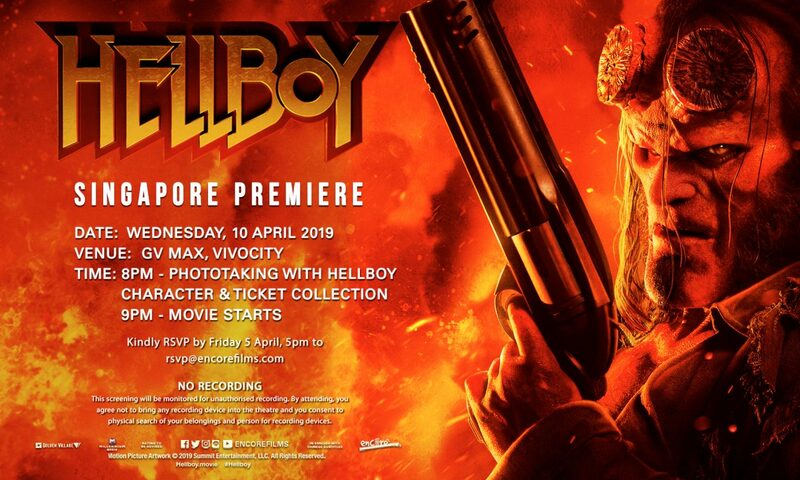 Email your answer, full name, NRIC and mobile number to events@sinema.sg by Friday, 5 April 2019 with the title HELLBOY GIVEAWAY. 4. Winners will be notified by email. We seek your cooperation to participate only if are able to attend the screening on the date. Thank you. Prizes courtesy of ENCORE FILMS.